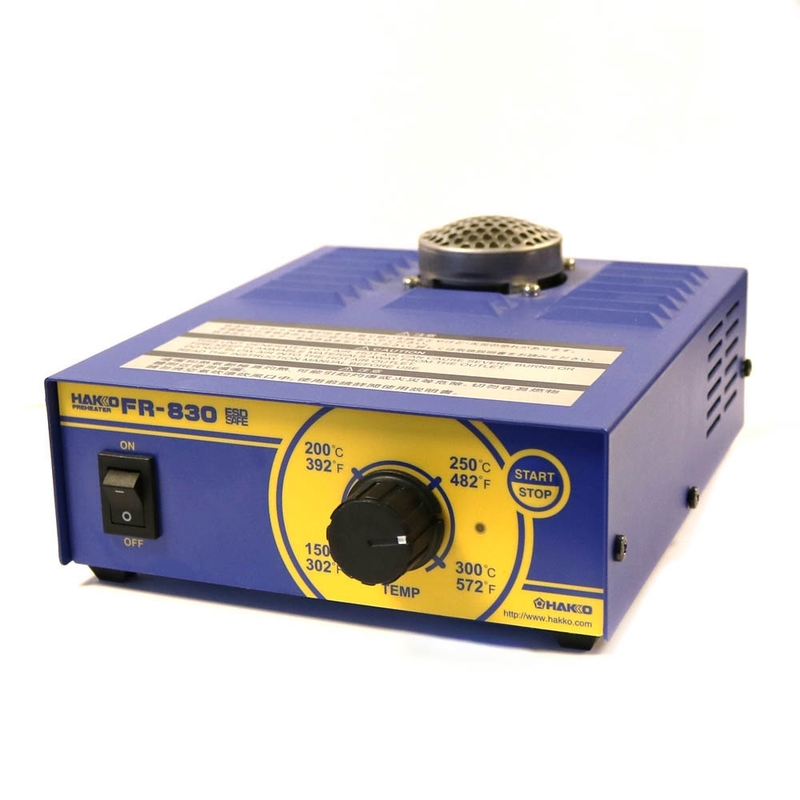 The Hakko FR-830 is a compact and low cost solution to preheating printed circuit boards. The design features on the FR-830 deliver consistent heat to the bottom of printed circuit boards and is particularly beneficial when soldering lead-free assemblies. The new Hakko FR-830 is a compact and low cost solution to preheating printed circuit boards. The FR-830 incorporates the same higher performance and FR-803B integration feature as the FR-820 but with improved durability over all previous Hakko hot air preheaters. The integrated self-resetting overheat protection, high pressure fan, and convex outlet reduces heat buildup and prevents blockage of the outlet, and the angled heater tube protects the heating element from damage caused by debris that may accidentally drop inside the heater opening. Closed loop temperature control allows the output air temperature to be set anywhere between 150° - 300°C (302° - 572°) and an optional Extension Pipe (B3263) extends the airflow an additional 27mm (1.1 inch). The FR-830 also has a port that allows it to be activated by an optional hand switch (B2763) or foot switch (B1649). 5.5(w) x 3.0(h) x 7.3(d) in. B1649 Foot Switch Foot switch for the FM-206/FR-830,375/373.